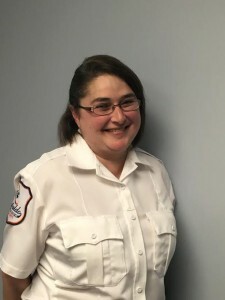 Pamela is being recognized as a Star of Life for an act above and beyond the call of duty, as someone who risked personal injury to assist a community member in need. On Thursday, September 17, 2015 at approximately 16:00, Pam was grocery shopping off duty when she heard a page over the store intercom announcing the need for anyone with medical training to run to the bakery area. Without hesitation, Pam responded. Upon arrival, she found a group of people encircling a male in his late 60s. He was unconscious, unresponsive, apneic, and pulseless. Pam immediately took control of the situation. She directed the bystanders to call 911, then began performing CPR for approximately six minutes by herself, before backup arrived to assist. Due to her efforts, the patient is alive today. Pam jumped right into providing patient care, although her job role is in EMS communications and dispatch. Additionally, she did so when she was recovering from recent abdominal surgery where she had fresh sutures and had been instructed not to perform any rigorous activities at risk of great bodily harm to herself. This is not the only instance when Pam has gone above and beyond the call of duty. She strives each day to assist 911 callers to the very best of her ability. She aids her fellow co-workers whenever she can, and is always willing to do whatever it takes to better the situation. She is polite, reassuring, ready to learn, and is truly the person you want on the other end of the phone if you need to dial 911 for assistance.